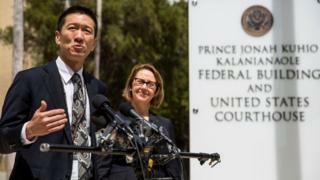 A federal judge in Hawaii has ordered that President Donald Trump's travel ban be halted. How else has this island state influenced the rest of the country? Days before US President Donald Trump's revised travel ban was to go into effect, US District Judge Derrick Watson halted Trump's plan, which would have placed a 90-day ban on people from six mainly Muslim nations and a 120-day ban on refugees. Fans of Trump's measures, which were signed as an executive order, expressed frustration that one small state, so far from the rest of the US, could halt the plans. "Hawaii, what do you know?" asked Twitter user @fiverights. As it turns out, Hawaii has been pretty active in influencing American culture since well before it became a state in 1959. "We're the link to the Pacific and Asia in many ways," said John Rosa, an associate professor of history at the University of Hawaii at Manoa. It's also where John F Kennedy visited in early 1963, during the height of the civil rights movement, and remarked that "Hawaii is what the United States is striving to be." How else has Hawaii influenced the rest of the US? The United States may have never joined World War II if it hadn't been for the attack on the navy base at Pearl Harbor on 7 December 1941 - the "date which will live in infamy". When Japanese forces attacked the military base on a Hawaiian island, it jettisoned the nation into a war that it would ultimately end by dropping nuclear bombs on Hiroshima and Nagasaki. The attack on Pearl Harbor remains one of America's most important historic events in the last century. It also helped turn Hawaii from an exotic outpost to a place of greater US visibility. "The attack on Pearl Harbor give greater visibility to Hawaii," Rosa said. "You do have veterans who 10 years after getting out of the service, they remember being stationed on Hawaii briefly. They're coming to Hawaii for vacation or at least considering it, whereas they would not consider any other place in the Pacific." Three Hawaiian princes brought surfing to the mainland in July, 1885, while on a short vacation in Santa Cruz, California. They rode redwood boards and the people of California took note. It sparked a new economic relationship between California and Hawaii as many surfers wanted redwood surfboards. Surfing developed a loyal following soon after, and later influenced US pop culture through music like the Beach Boys and dozens of 1950s beach party films. Hawaii also lays claim to the international symbol for "Hang Loose" - fists forward, thumbs and pinkies protruding to create a gentle y - known locally as the Shaka. 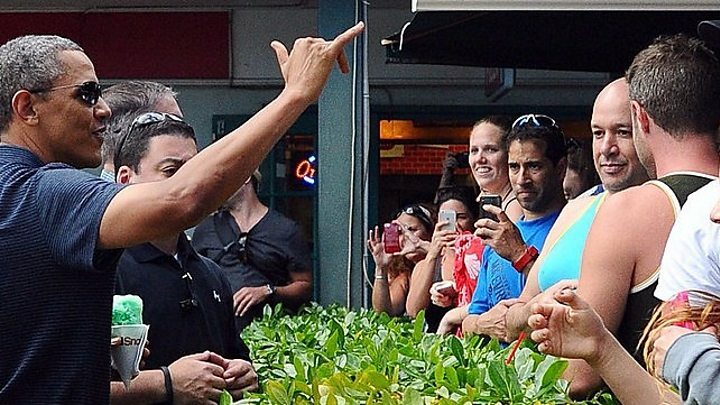 Former President Barack Obama was born in Honolulu just two years after Hawaii became a state. He spent most of his childhood in the Aloha State before attending Columbia University and Harvard Law School. He then moved to Chicago, where he served as a US Senator for Illinois before becoming president. "Some people have argued his outlook for the US as a global partner comes from his roots in Hawaii," Rosa said. "People in Hawaii are sensitive to the needs and wants of immigrants and are very sensitive to race relations," Rosa said. "That kind of informs not just the judge (who stayed Trump's travel ban) but also Obama." Although Spam wasn't invented in Hawaii (Minnesota gets that honour), the state is the Spam Capital of the nation. Hawaii's residents consume more Spam per capita than residents of any other state, eating about six cans of spam a year per person, on average. Spam and eggs, fried rice and Spam, and Obama's personal favorite - musubi - a sushi-like dish that couples Spam with rice and seaweed - are all popular offerings and dishes that have made their ways to the mainland. Aloha to the US: Is Hawai'i an occupied nation? The longest running police procedural of its time, Hawaii Five-O, was shot on a set in Hawaii. To help spread out costs, show creators developed a Hawaii detective show, Magnum PI - the show that launched Tom Selleck's illustrious career.